Second album from wide ranging electronics based duo. We've tried to create a series of works which combine sophistication of structure with immediacy and clarity of sound and purpose. MA supplied CB with a piano track. CB submerged this in a complex organic sounding electronic arrangement from which the piano part appeared and disappeared. On mixing the master this was changed to a piano piece with electronic backing. CB is considering a reversal on our next release with one of his piano pieces. DS added the beautiful trumpet part when the work was re-appraised in early 2001. Created in 2001 in the studio with guitars by BB. MA brought one electronic piece and CB brought a selection. The MA piece was recorded and CB xenosynchronously welded three shorter pieces of his own across it before the guitar parts were added. Originally this was four separate tracks created by CB from a lengthy non repetetive prepared and processed violin improvisation by MA. CB then put this through a lengthy process of processing and editing where the original track was split into four equal parts initially. These were then edited into repeatedly shorter sections and looped and rearranged. Finally, the sections were reassembled into multi-layered electro-acoustic structures with areas of repetition added to build the final tracks. In 2001 these were taken to the studio where each track was given a separate sopranino saxophone part. MA played three of these live with live processing (unheard by MA) by CB. The final track had a section of post recording harmonisation added. Track three was dealt with differently, in that CB sampled several short sections from the performances and then played these live to create a complex sax section. MA later reassembled the four tracks back into one. MA supplied CB with a keyboard melody. This suggested cold isolation and sub-arctic landscapes to CB and he enhanced these with appropriate cold synthesizer tones and atmospherics. The original track was a classic long TvR improvisation. Due to the input from KS on violin at the 2001 session, it was decided to treat the later section of the piece on the classical Indian form, although not the content, other than KS' aching opening developing into a rhythmic section with CB ceramic pot (like Indian ghatam, but actually African) and ceramic skin Indian hand drum. CB also opened the piece with an added hand percussion section and MA supplied sections of processed strings which CB mixed and placed at two points in the piece. Originally two tracks both based on initial organ parts by MA. CB added various synthesizer and rhythm unit parts to these , including guitar like sections. In 2001 the opportunity was taken to add more real guitars courtesy of BB and hack these apart and back into one track. CB removed sections of the tracks to accommodate BB guitars in the already dense mix, and freed a section of one of the organ parts more or less in isolation near the end of the track, giving way to a final trumpet and synth section. On Medulla we've tried to create a series of works which combine sophistication of structure with immediacy and clarity of sound and purpose, almost like contemporary chamber compositions played using "aware" electronic sounds. Some electronic CDs from the last decade already sound tired and out of date, and we hope that our very carefully chosen sounds and structures on this recording will continue to fascinate. And sorry Bjork, this CD was released before your CD of the same name. 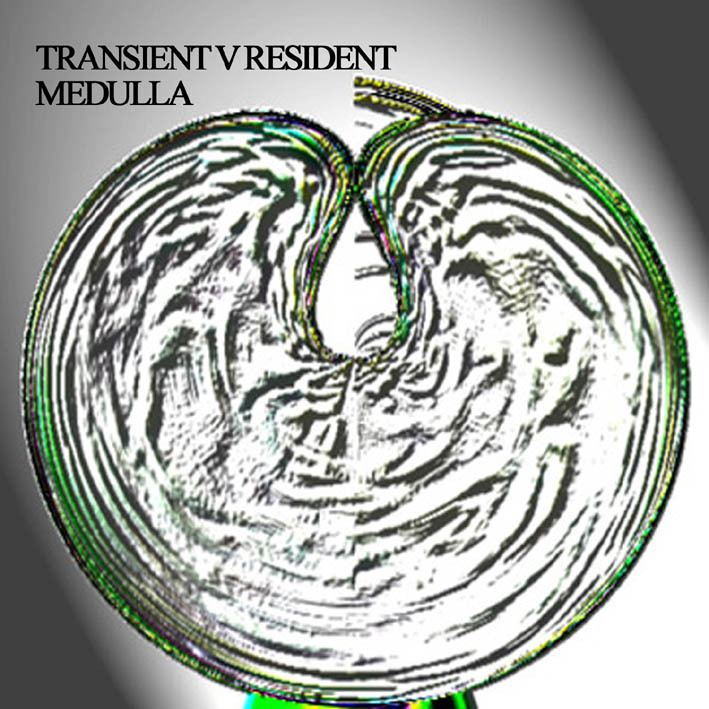 "Crossing a number of genre boundaries - modern classical piano, jazz improv, electronica - Transient v Resident aim to create improvised, electronic music which retains its freshness over time by carefully chosen sounds and structures. I think they achieve their aim, and expect to be listening to this album in years to come." - Ampersand Etcetera. "Electroacoustic composer Martin Archer uses melodic fragments and rhythmic patterns, but his music seldom builds to a climax or resolves itself in any sort of superficially coherent fashion. Instead, Archer offers the attraction of unusual timbres and textures, and an introspective atmosphere that mixes fragile, sometimes austere beauty with the stuff of hallucination and nightmare - quite often in the same piece. Archer's compositional processes, on this and other of his recordings, involve a bewildering assortment of intuitive studio additions, subtractions and manipulations of source material (emphasis on the "intuitive"). Somewhat tongue in cheek (one would hope), Archer relates that the foundation of one piece on Medulla was generated by "kicking the violin around the studio floor and occasionally poking it with a bow." This latest collaboration between Archer and longtime associate Chris Bywater (I'm assuming that Bywater is the "Transient," and Archer the "Resident") features the thirty-eight minute "Culm," which starts out with tribal hand-percussion and a dense cloud of mysterioso electronic effects, and then after roughly half its length introduces a haunting, raga-like theme featuring Kamalbir Singh on violin. Fans of Popol Vuh (especially "In The Gardens of Pharao") might notice parallels in the first half of "Culm," but the introduction of the raga element is a totally unexpected delight. With co-credits for electronics and processing, as well as sopranino sax (Archer) and percussion (Bywater), the two principals are certainly capable of going it alone -- as illustrated by the short but gorgeously ethereal "Fimbriata." But Archer's preference is for collaborative composition, and on Medulla he also solicits, treats and integrates recorded submissions from trumpeter Derek Saw, electric/acoustic guitarist Benjamin Bartholomew and the previously mentioned Singh. Saw's poignantly wispy muted trumpet line is inserted, to excellent effect, into what Archer accurately represents as an "electronic rainforest" on "Claviform," the CD's opening track.